ZapMessenger is an application that solves one of the main problems of MSN Messenger, now called Live Messenger, to delete any trace left behind by older versions of the program may cause an error that will make it impossible to update the application. 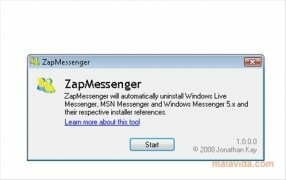 This small utility (it only has a button that once pressed, will do its job and then wait to be closed), will easily allow you to eliminate any installation of MSN Messenger and Windows Live Messenger, allowing any version to be installed from scratch. Furthermore, the uninstall processes don't affect any of the conversation history data nor the contact lists, because they are saved in different places to those where the data that can cause problems to the installers can be found. 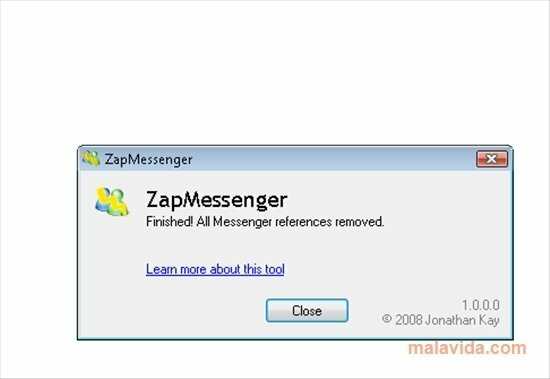 ZapMessenger searches through the hard drive in search of the installation and registry files that the several versions of the renowned instant messaging application by Microsoft has left on the system to be able to quickly remove them. This download requires a ZIP compatible compressor. It also requires that .NET Framework is installed.